Brandon Jacobs (Running Back, Giants) I think by now we've established that the New York Giants may be in a league of their own. They buy into what their coach is selling, they have a rushing attack second to none, and a newly anointed Manning son, that hasn't fallen far from the proverbial tree. However, this team didn't finish the season undefeated, like every other playoff team, they had their share of hiccups. Most notably, the two divisional losses to both Philadelphia & Dallas in the final month of the season. What was missing from the vaunted defending champions in those two games? A 100% healthy Brandon Jacobs. The Giants 1,000 yard rusher with 15 touchdowns is the motor of the Giant offense. No amount of Ahmad Bradshaw and Derrick Ward can equal the factor that is Brandon Jacobs. An injured knee has held up Jacobs since week 12, when he didn't play against Arizona. When playing against Philadelphia in a week 14 loss, Jacobs, in a limited role, ripped off 5.2 yards a carry. The Giant offense was unable to get an offensive touchdown in their week 15 loss against Dallas, playing without Jacobs. Against Carolina in a must win game, for home field advantage throughout, the Giants had a partially healthy Jacobs, who tore off 87 yards and three touchdowns to help the Giants to a 34-28 overtime victory. What Strahan & Umenyiora were to the Giants in the postseason last year, Brandon Jacobs will be this postseason. Shhh, but by the time he plays in the divisional round, he will have had 21 days to rest his knee. Adrian Peterson (Running Back, Vikings) My buddy Dan gets credit for this one, AP is probably the NFL's most dangerous player. I wrote yesterday that as Peterson goes, the Vikes go. Nothing could be more accurate. I can't recall a playoff team with a more questionable quarterback than the Vikings are with the anemic Tarvaris Jackson. The Vikings are 7-3, when their second year horse, goes for 100+. Peterson single handily came back and dropped the Packers with a devastating 29-yard touchdown run in the fourth quarter. He averaged 126 yards in two games against division contender, Chicago. While David Carr was second stringing it for the Giants and the Vikes were looking to get into the playoffs, it was Peterson with a 67 yard TD run in the first quarter and 4.9 yards per carry on the day that would lift the Vikes into the postseason. If Vikings fans, and fans of the NFL in general, are looking to dispatch of Donovan McNabb and the Eagles as quickly as possible, it'll be on the legs of Adrian Peterson. Jake Delhomme (Quarterback, Panthers) Wait, before you hit that "x" on the top of the screen, hear me out. Delhomme has made it through the playoff journey before, yes the Panthers defense was different then but this Panthers team is very, very good. Their rushing duo of Jonathan Stewart and DeAngelo Williams are largely responsible an attack that is 4th best in the league and averages nearly 153 yards per game. The veteran quarterback needs to tear a page from the Brad Johnson/Trent Dilfer playbook, don't lose the game and lean on your horses. Don't have games like you had in Oakland, a week 10 win, however, Delhomme was 7 of 27 with four interceptions and only 72 yards passing. Have games like you had in week 17, a road victory at New Orleans in which Delhomme was workman like going 14 of 20 with 250 yards passing and a touchdown. When Delhome stays in the 15-25 passing attempts per game range, the Panthers are 7-1. When Delhome is forced to throw 29+ attempts per outing, the Panthers are a mere 3-3. Keep the veteran Steve Smith involved in the offense, give the ball to your horses, and do not turn the ball over. 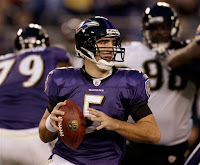 Joe Flacco (Quarterback, Ravens) For the Broncos, Browns, and Jets, all teams that have some working parts, take a look at franchies like Baltimore, Dolphins, and Atlanta for direction. Here's the deal, the Ravens had a good defense who needed to be inspired by their offensive direction, enter rookie quarterback, Joe Flacco. Flacco has made this defense believe they could win another Super Bowl, the same way Trent Dilfer made them believe they were good enough to win the Super Bowl. Much like Carolina's Jake Delhomme, Joe Flacco is instructed to notch victories on the board, doesn't matter how you get there, just notch them on the board. Joe Flacco can do that. The games that the Ravens and Flacco have lost, aren't against just anybody. (2)Two less than 4-point losses to Pittsburgh, a 3-point loss to the Titans, a loss to the Colts, and Giants. When the Ravens meet the Dolphins in Miami this weekend, it'll take another Joe Flacco 17/23 performance for 230 yards passing, if they want to advance. First year head coach, John Harbaugh has contained Flacco, the rookie out of Delaware has tossed 30+ balls only three times this season. Like the Dilfer years, you know what the Ravens fierce defense brings to the table, the key is what the man under center can add. Jason Jones (Defensive Line, Titans) Here is the only guy on this list the average NFL fan won't know. The rookie out of Eastern Michigan plays backup to All-World defensive lineman, Albert Haynesworth. With Haynesworth suffering recent injuries it has been Jones that is forced to fill the huge void on the Titans defensive line. While Haynesworth was sitting out a monumental gave against the Steelers just two weeks ago, Jones stepped in and recorded three forced fumbles along with 3.5 sacks on the afternoon. His effort pushed the Titans to a 31-14 victory and homefield avantage throughout the AFC playoffs. WIth both Haynesworth and fellow defensive lineman, Kyle Vanden Bosch, on the shelf with injuries, the Titans will lean on the rookie to give them the inside push. Given his recent play in the final month of the season, I'm sure the Jeff Fisher lead Titans are comfortable with Jones. Other titles for this column: Five, Five Dollar Fooooooot Long.